The opening number of Muppets Most Wanted makes fun of sequels that try too hard and end up being much worse. That cheap horror called 'Horrible' or whatever it was has a new friend in the list of films that accurately describe themselves. Most Wanted has the tone of a classic Muppet adventure, crossed with a heist caper – though not a particularly strong example of either. After their successful comeback, the Muppets go on a world tour, only for Kermit to be ambushed, sent to a Russian gulag, and replaced, against everyone else’s knowledge, by his evil doppelgänger Constantine. It’s not a bad set-up, and the ‘world tour’ premise certainly raises the scale, but the script lacks the sharpness and simplicity of the one Jason Segal provided for 2011’s The Muppets. 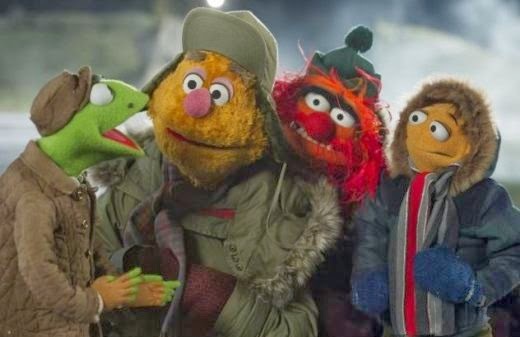 The narrative focus is as all-over-the-place as the Muppets’ tour. 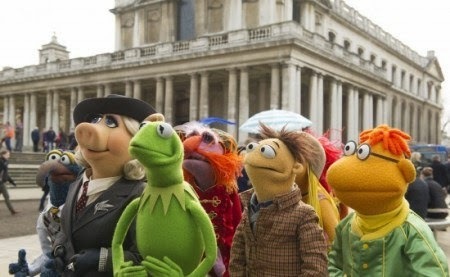 Whereas its predecessor focused on new Muppet Walter’s attempt to join the troupe and find his identity, this film has no real protagonist – the emotional arc seems to be the entire Muppet troupe realising that, while they want to do their own thing with the show and so initially relish Constantine’s flimsy management, they really need Kermit to guide them. As Constantine’s henchman Dominic Badguy, and the main human guest star, Ricky Gervais is, well, less annoying than I normally find him, but just boring and miscast, giving what seems like a phoned-in performance, a big contrast to Segal’s enthusiastic appearance last time around. And his duet with Constantine is quite clearly dubbed by someone who can actually sing. The film also suffers from having way too many fleeting celebrity cameos, to the point that they're just distracting. I mean, why are the museum security guards who appear for five seconds [well-known actor] and [well-known actor]? Why does [well-known actress] appear just to throw an expositional newspaper at Kermit? In moderation, these are fun, but to the extent that this film uses them, they’re pointless. It’s just showing off. The cameos that do work are the more extended ones that make fun of the actor’s public image – Danny Trejo as a tough-as-nails prisoner trying his hand at musical theatre is brilliantly silly, as is 'Christoph Waltz does the waltz'. 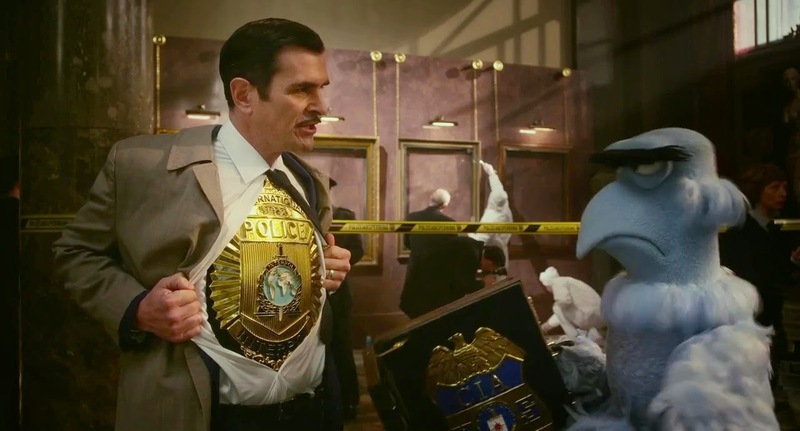 I did also enjoy Jean-Pierre Napoleon, the Clouseau-esque Interpol detective played by Ty Burrell – though not exactly politically correct, this gentlemanly character, with his exquisite manners and devotion to getting a fine lunch break, is an absolute delight to watch. So, while there are major flaws with Most Wanted and it's nowhere near as joyous and heart-warming as The Muppets, it does have just enough of that glorious Muppet daftness to make it worth the ticket price. And any scene with Fozzie Bear in can never go wrong by my standards. Waka, waka.